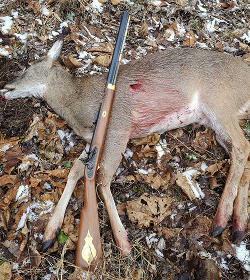 Some time back there was talk on a couple other muzzleloading forums about an odd shot load that improved your shot pattern. It was loosely referred to as a Skychief load. The reason it's an odd load is because instead of the fiber wad being behind the shot it was loaded IN FRONT of the shot. Whatever your combination of powder to shot doesn't really seem to matter, the key is to load the fiber wad soaked in olive oil or cooking oil last on top of the shot. Why it tightens your shot pattern I don't know but this last weekend I got a chance to try it and I was pleased and surprised at the results. I've always liked to load my smoothbore with 80gr's of 2FF, over powder card, 90gr's of #5 shot then over shot card. I use to load a fiber wad behind the shot but stopped doing that because it was said the wad would blow a hole in your shot pattern. This time I loaded my same load but I pushed a oil soaked fiber wad down to top it off. My smooth bore is a 16ga Fusil Fine with a 46" cylinder bore barrel, at 25 yds this was my pattern. I'm sure I can kill a turkey out to 30yds, I'll do more testing before the season opens later this month. That pattern looks great. I always use wasp nest under and over my shot. Seems to work well. I've read several posts about that Sky Chief load and all seemed to be positive about it. I had better luck using paper shot cups in my 12 gauge cylinder bore. The best thing I did, though, to tighten up my pattern for turkeys was get one of the 20 gauge Colerain turkey barrels. Man, does it throw a tight pattern! [ The best thing I did, though, to tighten up my pattern for turkeys was get one of the 20 gauge Colerain turkey barrels. Man, does it throw a tight pattern! They say you can't shoot round ball in them. Any chance you could post a pic of the wads and card used? I have a .62 Fowler and it took me some time to find a tight pattern for my smoothie. No turkey barrel or jug choke. I tried several combo’s which never held a tight pattern or a consistent one at that. So i did a lil searching and found two things on getting a tight pattern. One was V.M. Starr and Danny Caywood. So to get to the point, anything behind the load of shot that is heavier then an individual piece of shot your pattern will open up. So i gave it a try at 25yrds and boy was i surprised! My load was 75gr 2F, 4 over shot cards, 1 1/8oz #5’s, and one over shot card. At 25yrds i could put 40ish pellets in a 10 or 12” circle(i forget what i used). If i used 1 1/4oz of #5’s it went to about 50ish pellets. I shot many more times and was able to keep a consistent pattern shot after shot as long as my aim was consistent. Now the only problem i had when doing this was very low humidity. I used no lubed wads or any lube at all. The fowling was hard as heck but i didn’t care because of the pattern i was getting. Hopefully this spring i get to find out how good this load really is on a Jelly Neck!